Struga Banska (Serbian Cyrillic: Струга Банска) is a village on the river Una in central Croatia. It is connected by the D47 highway. 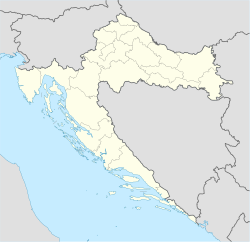 The nearest larger towns are Dvor (Croatia) and Novi Grad (across the river in Bosnia). ^ "Registar Geografskih Imena Nacionalnih Manjina Republike Hrvatske" (PDF). Archived from the original (PDF) on 2013-10-29. Retrieved 2013-03-08. This page was last edited on 12 November 2018, at 16:23 (UTC).